This map and directions will get you to Banamichi and Hotel Los Arcos de Sonora. Take highway 19 south and cross into Nogales, Mexico. Turn left at the bottom of the ramp, towards Cucurpe crossing under the highway on Highway 54 to Sinoquipe, 74 miles. 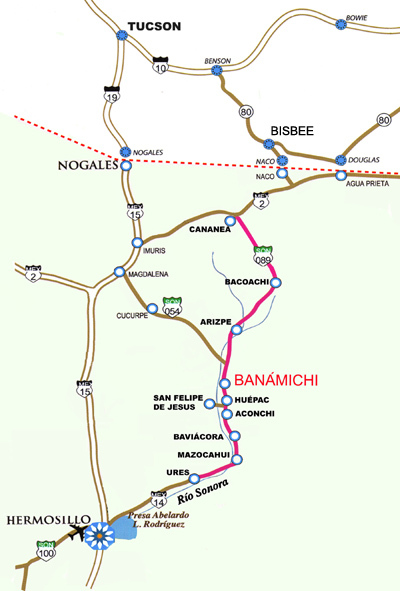 Turn right at the stop sign in Sinoquipe onto Highway 89 and continue on to Banámichi. Continue on State Highway 89 to Banámichi.